This page contains completed work with linked sites copyrighted by the publisher. Please read my use policy if you download from this site. Use Policy. You may also wish to check out my ResearchGate page if an earlier version of the paper is adequate for your needs. For a more complete record, visit my ORCID site. There are errors on the Google Scholar record that bots perpetuate. New in October: The Future of Ocean Governance and Capacity Development: Essays in Honour of Elisabeth Mann Borgese (1918-2002), edited by the International Ocean Institute Canada. Essays by more than 80 experts including eight on marine transportation, edited by Mary R. Brooks. The book was published in September. My own essay, entitled National Shipping Policies and International Ocean Governance, is found on pages 450-455. Clicking on the title will take you to a pdf preview (the first two pages). Forthcoming: Farrell, Sheila and Mary R. Brooks (2018, in press). The Principles Underlying Port Policy: Are They Still Relevant Today? International Journal of Shipping, Transport and Logistics (special issue in honour of Richard O. Goss [Paul T.W. Lee and Kevin B. Cullinane, eds.]) To order, click on the journal title. Published Online: Rowsell, Joe, Mary R. Brooks, Kris Behrens, Trevor Heaver, and John Lawson (2018). Valuing Freight Transport: A Canadian Example of the Role of Selected Methodologies, to be part of the ‘Valuing Transport’ volume of Research in Transportation Business and Management. Frost, James D. and Mary R. Brooks (2017), Short Sea Shipping and Ferries, in The Routledge Handbook of Transport Economics, Jonathan Cowie and Stephen Ison (eds. ), 325-347. Brooks, Mary R. and Gordon Wilmsmeier (2017). A Chilean Maritime Highway: Is It a Possible Domestic Transport Option? Transportation Research Record, Volume 2611, pages 32-40. The DOI is 10.3141/2611-04. The paper was presented at TRB in January (see the speeches and webinars page for a copy of the presentation). Brooks, Mary R., Kevin B. Cullinane and Athanasios A. Pallis (2017). Revisiting Port Governance and Port Reform: A Multi-country Examination, Research in Transportation Business & Management, 22, 1-10. Click here to go to ScienceDirect to download. (There may be a fee.) If you are interested in a listing of all the articles in the volume, click here for a listing of all the articles with direct links to the ScienceDirect purchase site for each. Rezaee, Sara, Mary R. Brooks and Ronald Pelot (2017). Review of Fishing Safety Policies in Canada with Respect to Extreme Environmental Conditions and Climate Change Effects. WMU Journal of Maritime Affairs, 16, 1-17. Online Article: Brooks, Mary R. (2017). Disruption on the Docks: How Automated Terminals Could Impact Global Trade, Reconnecting Asia, February 7. Schellinck, Tony and Mary R. Brooks (2016), Developing an Instrument to Assess Seaport Effectiveness in Service Delivery. International Journal of Logistics: Research and Applications, 19 (2), 143-157. Schellinck, Tony and Mary R. Brooks (2016), Does Superior Service Performance Provided to Shipping Lines Improve the Perceived Value of a Port? International Journal of Shipping and Transport Logistics, 8 (2), 175-193. Brooks, Mary R. and Tony Schellinck (2015). Measuring port effectiveness: What really determines cargo interests’ evaluations of port service delivery? Maritime Policy & Management, 42(7), 699-711. Brooks, Mary R. and Tony Schellinck (2015). Measuring port effectiveness: Does supply chain partner performance matter? Transportation Research Record, 2479, 42-48. DOI: 10.3141/2479-06. Brooks, Mary R., Ricardo Sánchez and Gordon Wilmsmeier (2014). Developing Short Sea Shipping In South America – Looking Beyond Traditional Perspectives, Ocean Yearbook, 28: 495-526. Brooks, Mary R., Thanos Pallis and Stephen Perkins (2014), Port Investment and Container Shipping Markets (DP 2014-03), Paris: OECD International Transport Forum, April. Schellinck, Tony and Mary R. Brooks (2014), Improving port effectiveness through determinance/performance gap analysis; Maritime Policy and Management, 41, 4, 328-345. Brooks, Mary R. (2014). Maritime Security in Canada, in Maritime Transport Security, Khalid Bichou, Joseph S. Szyliowicz and Luca Zamparini (eds), Edward Elgar Publishing Limited, 141-158. Brooks, Mary R. (2014). The Changing Regulation of Coastal Shipping in Australia, Ocean Development and International Law, 45 (1), 1-17. 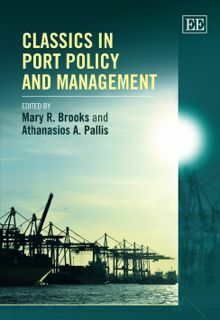 Brooks, Mary R. and Athanasios A. Pallis (2013), Editorial: Advances in Port Performance and Strategy, is now available for the Special Issue on this topic available from Elsevier’s Research in Transportation Business and Management. If you want a listing of the articles, with links to their ScienceDirect location, please click here. Brooks, M.R., Pelot, R., Reuchlin, J.W. and Rezaee, S. (2013). Dalhousie Marine Piracy Project: Non-Operational Predictive Indicators of Piracy: Identifying Potential Outbreaks. (Marine Affairs Program Technical Report #10). Brooks, Mary R. and Athanasios A. Pallis (2012), Classics in Port Policy and Management, Camberley, UK: Edward Elgar Publishing. Brooks, Mary R., Sean M. Puckett, David A. Hensher and Adrian Sammons (2012), Understanding Mode Choice Decisions: A Study of Australian Freight Shippers, Maritime Economics and Logistics, 14, 274-299. doi:10.1057/mel.2012.8. Winner of the 2011 IAME Best Paper Prize and the 2012 Korea Association of Maritime Industry Prize. Brooks, Mary R. (2012), Maritime Cabotage: International Market Issues in the Liberalization of Domestic Shipping, in The Regulation of International Shipping: International and Comparative Perspectives: Essays in Honor of Edgar Gold, Aldo Chircop, Norman Letalik, Ted L. McDorman and Susan Rolston (eds), Leiden: Martinus Nijhoff Publishers, 293-323. Brooks, Mary R. and A. A. Pallis (2011), Port Governance. In: Wayne T. Talley (ed.) Maritime Economics – A Blackwell Companion, Blackwell Publishing Ltd, 491-516. Brooks, Mary R. (2011), Seaports, Intermodal Transportation: Moving Freight in a Global Economy, Chapter 9 in L. Hoel, G. Giuliano, and M. Meyer (eds), Washington: Eno Transportation Foundation, Inc, 270-301. Brooks, Mary R. (2010), International Trade in Manufactured Goods, in The Handbook of Maritime Economics and Business (2nd edition), Costas Th. Grammenos (ed.) London: Lloyd’s List, 99-116. Brooks, Mary R. (2009). Liberalization in Maritime Transport, Discussion Paper for the International Transport Forum 2009 on Transport for a Global Economy: Challenges and Opportunities in a Downturn, Joint Transport Research Centre of the Organisation for Economic Cooperation and Development, Leipzig, May 26-29, 2009. Hossain, Kamrul, Hugh M. Kindred, and Mary R. Brooks (2009), The Challenge of Maritime Security against Terrorism: A Dialogue Between the European Union and Canada, in T. Koivurova, T et al. (eds), Understanding and Strengthening EU-Canada Relations in the Law of the Sea and Ocean Governance, Rovaniemi, Lapland: University of Lapland Printing Centre, 351-386. Kindred, Hugh M. and Mary R. Brooks (2009), Consequences of Securing Merchant Shipping for Contractual Relations in the Carriage of Seaborne Trade, in The Future of Regime-Building in the Law of the Sea: Essays in Tribute to Douglas M. Johnston, Aldo Chircop, Ted L. McDorman and Susan J. Rolston (eds. ), Leiden: Martinus Nijhoff Publishers, 319-348. Brooks, Mary R. (2008), North American Freight Transportation: The Road to Security and Prosperity. Cheltenham: Edward Elgar. Brooks, Mary R. and Ron Pelot (2008), Port Security: A Risk-Based Approach, in Maritime Safety, Security and Piracy, Wayne Talley (ed.) London: Informa Publications, 195-216. Brooks, Mary R. (2007), Addressing Gaps in the Transportation Network: Seizing Canada’s Continental Gateway Advantage, Toronto: Conference Board of Canada, October. ISBN: 978-0-88763-802-2. Brooks, Mary R. and Kenneth J. Button (2007), Maritime Container Security: A Cargo Interest Perspective, in Port Operations, Logistics and Supply Chain Security: Frameworks, Models and Applications, Bichou, K., M. Bell and A. Evans, (eds. ), London: Informa, pp. 221-236. Brooks, Mary R. and Kevin Cullinane eds. (2007), Devolution, Port Performance and Port Governance. Oxford: Elsevier. Hodgson, J.R.F. and Mary R. Brooks (2004), Canada’s Maritime Cabotage Policy: A Report for Transport Canada, Halifax: Marine Affairs Program, pp. 83. Hodgson, J.R.F. 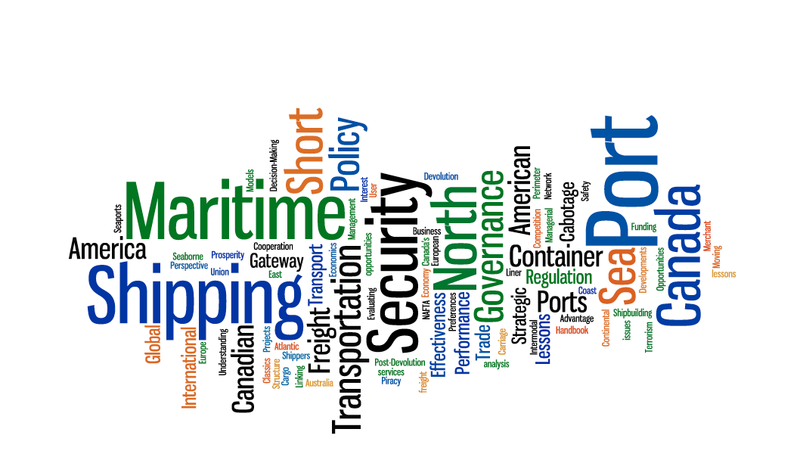 and Mary R. Brooks (2003), Recent Developments in International Shipping Policy and Their Implications for Canada, A Report for Transport Canada, Halifax: Marine Affairs Program, pp.103. Brooks, Mary R., Kenneth Button and Peter Nijkamp (2002), Maritime Transport, Cheltenham, UK: Edward Elgar as part of a 8-volume Classics in Transport Analysis series edited by Kenneth Button and Peter Nijkamp, 558 pp. Brooks, Mary R., Tony Schellinck and A. A. Pallis (2011), Port Effectiveness: User’s Perspectives in North America, Transportation Research Record, 2222, 34-42. DOI: 10.3141/2222-05. Bendall, Helen B. and Mary R. Brooks (2011). Short Sea Shipping: Lessons For or From Australia, International Journal of Shipping and Transport Logistics, 3 (4), 384-405. Brooks, Mary R. and A. A. Pallis (2011), Issues in Port Policy: A Look Back to Look Forward, 2011 Annual Meeting Proceedings of the Canadian Transportation Research Forum, Gatineau, May, 253-267. Brooks, Mary R., Tony Schellinck and A. A. Pallis (2011), A Systematic Approach for Evaluating Port Effectiveness, Maritime Policy and Management, 38 (3), 315-334. DOI: 10.1080/03088839.2011.572702. Puckett, Sean M., David A. Hensher, Mary R. Brooks and Valerie Trifts (2011). Preferences for Alternative Short Sea Shipping Opportunities, Transportation Research E: Logistics and Transportation Review, 47, 182-189. Brooks, Mary R., R. McCalla, A. A. Pallis and L. Vanderlugt (2010). Strategic Cooperation in Peripheral Ports: The Case of Atlantic Canada’s Ports, Canadian Journal of Transportation, 4 (1), 30-42. Blank, S., Brooks, M., and Quigley, K. Moving Forward on the Atlantic Gateway: Context and Further Key Questions. Canadian Journal of Transportation, North America, 3, Jul. 2010. Brooks, Mary R. and J. D. Frost (2009), Short Sea Developments in Europe: Lessons for Canada, presentation to the 2009 Annual Meeting of Canadian Transportation Research Forum, Victoria, May. Reprinted by the Transportation Research Competitiveness Council as TRC Working Paper 10. Hodgson, J.R.F. and Mary R. Brooks (2007), Towards a North American Cabotage Regime: A Canadian Perspective, Canadian Journal of Transportation, 1, 1. Brooks, Mary R. (2011), North American Perimeter Security: How Best to Keep Trade Moving? TR News, Washington, DC: Transportation Research Board, July-August, 37-43. Copyright owned by the U.S. National Academies. Transportation Research Board (2009) Special Report 297: Funding Options for Freight Transportation Projects, Washington: TRB. Brooks, Mary R. (2004), The Governance Structure of Ports, Review of Network Economics: Special Issue on the Industrial Organization of Shipping and Ports, 2, 2, 169-184. If you don’t find something you are looking for, please contact me at maryrbrooks@mac.com.